Once, during the first December I remember, a car barreled into our yard, tearing up some bushes, and my mom made wreaths out of the wreckage. The wreaths signaled that the big day was getting closer. When Christmas finally came, I got the gift I’d been wishing for, from the FAO Schwartz catalog I’d been using as a prayer book: a fist-sized green metal combat van that shot small yellow rubber missiles from guns in its roof. Freshly unwrapped, it felt heavy, solid. I’m tempted to say it felt magic, even holy. There was nothing better than Christmas. There was nothing better than getting things. And boy, did I get things. My family lived on the cheap throughout the recession-stung 1970s, and there were times when we were just barely scraping by. A yearly pre-Christmas tradition was my mom tearfully telling my brother and me that because of money troubles “Christmas isn’t going to be the same this year, boys,” a claim we learned to shrug off because every Christmas morning the lower half of the tree would be obscured behind a mountain of presents, like always. It was my favorite day of the year, and no other day even came close. I got and got and got. By the end of the hours of unwrapping I was always high from candy and getting, my arms resting on stacks of brand new things. It was always a little sad to come to the last present, that moment like the first strand in the gradual unraveling of the feeling of holy solidity given to me by all my new things. Those things all broke, eventually, or were lost. None of them have made it to the present moment, and only a few exist in my memory. I did recently replace a gift from a long-ago Christmas. Maybe it was a gift for my brother and me, or possibly even a gift for my brother that I took co-ownership of. It came from my uncle during the day’s second stage of gift-getting, when my extended family gathered: a Neft and Cohen baseball encyclopedia. Its size and the tiny type and all the numbers seemed daunting, a grown-up thing, but below that there was something calling to me, saying that there was a place for me somewhere in that book. Eventually it became my bible. This was in 1974. I’d gotten my first baseball cards that year, just a few. In 1975 I began to collect even more. It can’t be an accident that my biggest childhood hobby, by far, included key elements from my favorite day of the year: wishing, unwrapping, sugar, and getting. 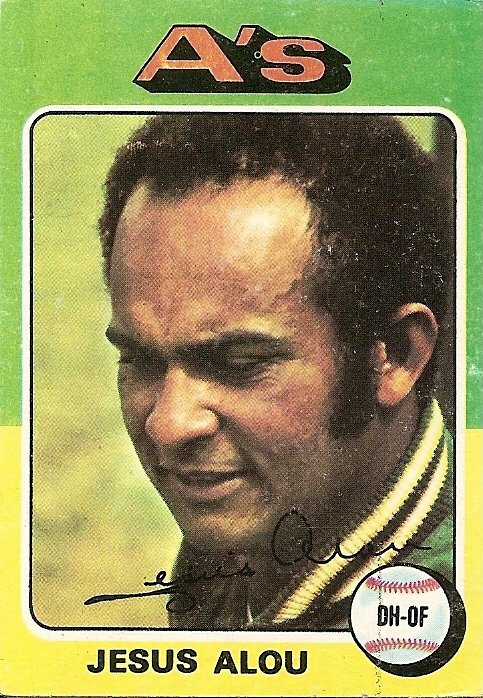 This card came to me that year, and I’m sure it made an impact. Jesus? A guy named Jesus? (I certainly didn’t know at that time that the player actually pronounced his name Hay-Soose.) And not just any guy, but a balding, troubled man with lines and bulging veins marking his face, seeming as if he’d just discovered that he’d locked his keys in his car again. Jesus came into my life that day, but not the flawless cherubic Jesus afloat in the carols my extended family sang every Christmas as my brother and I took turns on our new Mattell Electronic Football and ate peanut brittle. No, this was a new Jesus, an imperfect sweating journeyman with waning numbers and decreasing playing time. This was the Jesus that would in a tiny but persistent way stay with me as all my other childhood gifts scattered to the various landfills of this holy finite world.